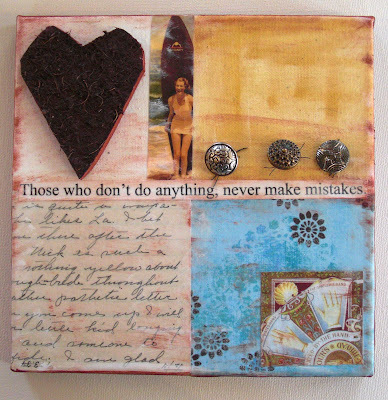 This is an 8 x 8 collage. Again with a word. 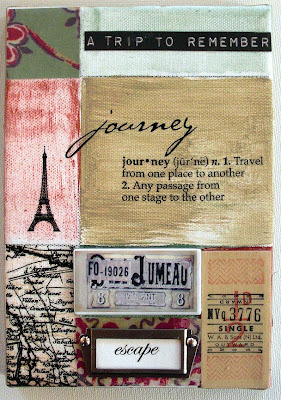 I used a vintage postcard from Bryn Mawr a vintage letter, paint, a flashcard, paper, and a metal hinge. This one is on on a 4 x 7 canvas. I used paint, rub-decals from 7 gypsies, a vintage train ticket, reprodution images, and metal hardware. Kerry and I are always looking for new art adventures. In addition to launching our new webstore (see below) are are venturing deeper into the world of collage. Who knows, we may even put some of our new collage items up on our store. For now, I'd just like to give you a quick sneak-peek. This is one of my mixed media collages. It is on a 8 x 8 canvas. 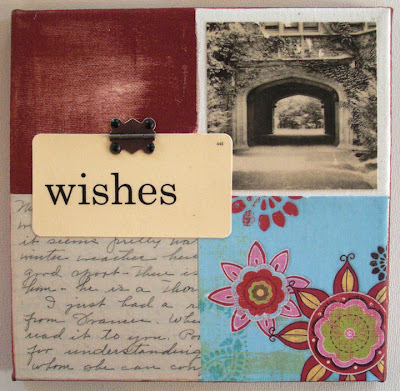 I used a vintage letter, reproduction images, antique buttons, paint, mod podge, handmade and other papers as well. As always, I like to incorporate words into my work. I used the quotation "Those who don't do anything, never make mistakes." I like the sentiment. It challenges me to take some chances, maybe I will make some mistakes. Hopefully, the chances I take will lead me to more creativity and fulfillment. Although I sometime find it hard to know when to stop, I am calling this piece complete. I think I like the final result.